DTDC tracks and traces the consignment with its customized software named Consignment Tracking and Billing System (CTBS). Delivery commitment is ensured with added focus on minimizing possible delays in the delivery timeline. The client is involved in the process, with transparency about the consignment transit time and a feedback mechanism of the delivery details. DTDC has incorporated a system of reports that double checks the consignment status right from pickup, delivery and receipt of the Proof of Delivery (POD) details into the CTBS system and the internet. A chain of records is generated for every process to which the consignment is subjected. This also detects any damages to the consignment at every stage of its journey. The consignment is also tracked at every stage to identify and minimize delays. For all bookings done over the counter and from cash counters, the cargo is physically checked for restricted and banned items. The consignments picked up from regular customers are also subject to random check for corrosive, poisonous or explosive contents or any other substance that may cause damage to the mode of transportation of the cargo. All airlines insist on a written declaration for every bag handed over for carriage. The format clearly defines the list of hazardous products and incorporates the courier's acceptance of the stipulated conditions as well. Should any of the banned or hazardous items be detected, the airline is authorized to ban the transportation of the courier on all sectors with immediate effect. Applicability: The provision set out and referred to in the consignment note shall apply to modes of transport used by DTDC for connection of consignments. They also apply if the mode of transport as described on the face of the consignment note is contrary to the original contract between the parties or performed by one or more modes of transport which may not be the defined mode of delivery of the consignment as agreed in the consignment note. “DTDC” means DTDC Express Limited. “Parties” mean and include the consignor, the consignee and/or his/her authorized representatives. “Freight” referred to in the consignment note means the transportation charges alone and it excludes the other components like COD / TO PAY / MENTION PC charges, taxes and other levies. Delivery means tender of shipment to the parties or intimation about arrival of the shipment at the destination. DTDC is entitled to use any mode and route for transportation. DTDC is a private carrier and its rights and liabilities are governed exclusively by the express terms set out herein below, subject to the applicable laws. The consignment note constitutes a binding contract between DTDC and the parties. The consignment note issued by DTDC shall be strictly based on the declaration given by the parties. DTDC shall not be responsible for any wrongful declarations contained in the consignment note and the parties shall remain solely liable for the same in the event of goods undergo consequential loss/ refund. Further the parties agree to make good any losses to DTDC in case of any claims being lodged on DTDC on account of delays arising out of insufficiency of documents or wrongful declaration contained in the consignment note. DTDC has the right but not the obligation to open and / or inspect any shipment consigned by the consignor to ensure that all the items are capable of carriage to the destination within the standard operating procedure and handling methods. DTDC does not warrant that any particular item to be carried is capable of carriage without infringing the law of any state of the country from / to or through which the item may be carried. DTDC reserves the right to refuse the consignor not conforming to these terms and conditions without assigning any reasons whatsoever. The parties are solely responsible for all / any payments levied by the government or any statutory body in respect of any consignment. The parties hereby declare that the consignment covered under the consignment note does not include any contraband / legally restricted / hazardous / flammable/ poisonous/ explosive / currency / jewelry / food coupon / share certificate or articles categorized as prohibited under the regulations of the IATA (International Air Transport Association). DTDC shall have a general lien over all the consignments of the parties towards any dues payable to DTDC by the parties. DTDC shall not entertain any warehouse booking & delivery unless the declaration form available with the concerned operating units is duly filled up along with the necessary enclosures and handed over to the concerned person. The parties shall pay the freight and other charges at the time of booking or within the payment period stipulated in the consignment note. In case of non –payment of the bill amount within the stipulated time the parties shall be liable for payment of interest at the rate of 2% per month. The bills will be raised even if POD (Proof of Delivery) copy is not submitted. DTDC advises the parties to insure the goods handed over to DTDC for transportation under the consignor insurance. In the event of any loss DTDC shall provide COF (certificate of facts) on request. A COF charge of 0.2% on the invoice value shall be charged. No claim shall be entertained by DTDC for any loss or shortage / damage / non-delivery / breakage / leakage / pilferage, etc. of the consignment unless a written claim is lodged within three (3) days from the date of delivery subject to the provisions under risk coverage or general liability clause of DTDC. Value added services COD / TO PAY are provided at additional charges over and above the freight charges without any liability on DTDC’s part whatsoever with respect to the original contractual obligations or payment terms between the consignor and consignee or any third party. Subsequent to booking of a consignment if the consignor makes any changes in the address or any other changes, additional charges shall be levied as a result of such a change. It is the responsibility of the consignor to provide the necessary documentation including but not limited to invoice, packing list, permits and forms as applicable in accordance with laws of the destination of the goods. Any consequences including but not limited to penalty seizures shall be the sole responsibility of the consignor. 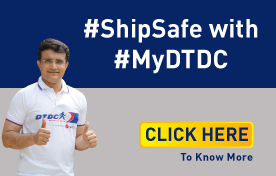 If the parties do not take delivery of the consignment for any reason whatsoever, DTDC shall raise bills on the parties towards the transportation and other charges including transport charges in accordance with the terms of the contract and the parties shall be liable to pay all dues payable to DTDC whether at the original booking station or elsewhere as notified by DTDC. The demurrage clause shall apply for a period of one (1) month and if the consignment is not accepted by the parties within this period for any reasons and the parties fail to make the payments due to DTDC, DTDC shall be entitled to send the consignment to its unclaimed goods department to proceed with the sale of the consignment to realize all dues by issuing prescribed notices. Consignments carrying valuable items may take an additional day, over and above the committed delivery due to security reasons and inspection process in between. The Business operations of DTDC are decentralized and operational autonomy provided to the respective operational zones based on geographical coverage. Operational empowerment and responsibility rests with the respective zonal heads on an exclusive basis for performance of all obligations of DTDC under the consignment note. The directors of DTDC are not directly involved or responsible for individual consignment notes for which exclusive responsibility rests as said with the respective zonal heads / product heads. The liability of DTDC if any, in delay of the shipment (subject to any exceptions available under law) shall be to the extent of basic freight charges only. DTDC shall not be responsible for any consequential losses/claims. All demands claims arising from the consignment note shall be paid at the registered office of DTDC situated at no 3. Victoria Road, Bangalore. Karnataka and all demands by DTDC shall be deemed to have been made by DTDC Bangalore. Any dispute or differences arising from any consignment shall be referred to adjudication by a sole arbitrator. DTDC shall be entitled to nominate the sole arbitrator to adjudicate any dispute differences or claims arising out of any consignment. The venue of arbitration shall be at Bangalore. Courts at Bangalore shall have the exclusive jurisdiction on all claims arising from any consignment. The terms and conditions stipulated are in addition to special contracts, if any between DTDC and the parties. For any product specific terms and conditions, please refer Terms & Conditions listed overleaf of respective product consignment note or obtain the details from nearest booking counter / branches.